As the Saudi-led coalition storms the airport compound of Yemen’s main port Hodiedah, in attempts to recapture the city which is considered the lifeline for food and medicine imports into Yemen, fears mount for the safety of the 400,000 civilians living in Hodeidah. Residents have reported hearing explosions, machine guns and artillery. Panic has set in and those who could flee the city did so, adding to the numbers of internally displaced Yemenis. “There is death and destruction everywhere in this city,” says a resident who spoke to CBC news. 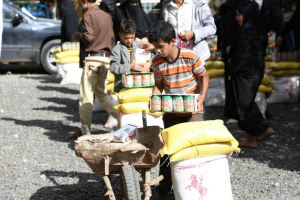 “Now we focus on Hodeidah,” says Muna Luqman, a Yemeni humanitarian activist and founder of Food4Humanity organization. “People in Hodeidah are completely under siege, but we were able to convince conflict parties to open up to let people leave. We are now trying to reach those still inside.” On Monday, the U.N. said that around 5,200 families had fled the fighting in Hodeidah. Luqman says that since the Red Cross pulled out in early June, civilians are not getting the help they desperately need. Food4Humanity has been providing humanitarian aid since 2014 to Yemenis affected by the war, especially in the city of Taez. Luqman is now turning her attention to Hodeidah. The humanitarian situation in Yemen is only growing from bad to worse, becoming the world’s worst humanitarian crisis with more than 22 million people in desperate need of aid and protection, lack of clean drinking water, risk of a cholera epidemic, lack of medicine, and an estimated 8.4 million on the verge of starvation. “Nearly half of all children aged between 6 months and 5 years old chronically malnourished,” UN Secretary-General Antonio Guterres said in April. This was before the battle to win Hodeidah started raging, the cost of which could reach 250,000 lives as per United Nations’ officials estimates. On 15 June, the United Nations Security Council failed to agree on a statement calling on the Saudi-led coalition to implement a ceasefire with both the United States and the United Kingdom opposing the text proposed by Sweden. Instead, the council called for restraint and “urged all sides to uphold their obligations under international humanitarian law” in fighting for Hodeidah. The battle to recapture Hodeidah “could have a devastating impact on civilians both in the city and elsewhere in Yemen,” Sarah Leah Whitson, Middle East director at Human Rights Watch, said. She added that both the coalition and the Houthis have “atrocious” records adhering “to the laws of war.” The conflict has, so far, resulted in over 10,000 deaths and two million people displaced. Create a sustainable funding system for local civil society to enable them to continue the work. “Volunteers need training. The length of the war is drying up local funders. The road is long ahead of us, even if the war ends now, there is a lot needed to save the people,” Luqman says.